Holy Basil, or Tulsi, is an herb that is commonly used in Ayurvedic medicine and is considered to be the most sacred plant that has incredible significance, both spiritually and health-wise. It is classified as an adaptogenic which means it helps restore the body to a more balanced state, especially in times of stress. And reducing stress isn't just a matter of feeling better, it's actually about being physically healthier. Though the effects may be subtle at first, they are real and undeniable. It is sometimes referred to as "liquid yoga". Due to the stress-relieving properties of the herb, it may be used to help control binge eating, which aids in beneficial weight loss. Traditional uses for this herbal tincture include arthritis, inflammation, headaches, common colds, bronchitis, asthma, diarrhea and stomach disorders, and heart and artery conditions. The list is huge, but also contains malaria, ulcers, hiccups, eye, and skin diseases, various forms of poisoning (food, snake, scorpion, and others), and ringworm. It's also great for dental health and healthy gums. Holy Basil and other adaptogenic herbs are known to help the body deal with stress. This is foremost for optimum health. Chronic stress is a modern day problem and epidemic that afflicts many of us these days. This can lead to chronic inflammation, slow metabolism, and abnormal immune responses. The high levels of cortisol that are created lead to complications such as leaky gut syndrome, increased appetite, weight gain, thyroid disorders and an increase in the degeneration of brain neurons. It is also a common problem for those who suffer from depression and anxiety. Holy basil contains phytonutrient potent oils such as rosmarinic acid, eugenol, ursolic acid, caryophyllene, and others. It also contains high levels of vitamin C and A which are essential antioxidants that go through the body scavenging free radicals and improving cell integrity and genetic expression. In conventional medicine, cancer treatments can cause inherent toxic side effects on the body. Holy Basil has been found to help provide protection against the instability of genes, caused by radiation. The effects have been attributed to the presence of eugenol, flavonoids, vicenin, and orientin. In studies, they exhibit not only the antioxidant abilities but also aid in the removal of toxins from the body, as well as to help prevent inflammation and damage to healthy tissue. The high vitamin C and other antioxidants found in Holy Basil helps to protect the heart from free radicals while reducing cholesterol levels in the blood. Research from India's Annamalai University found that the whole leaf extract significantly reduced lipid and protein oxidation. Oxidative stress is related to a number of disorders including cardiovascular disorders, aches and pains, Alzheimer's disease, dementia, liver issues and others. 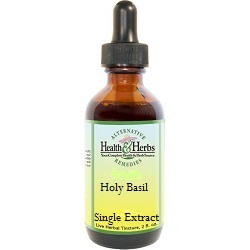 Since the 1990's, Holy Basil extract's ability to control blood glucose and operate as a good natural supplement is widely known. The herb acts as a detoxifying, cleansing and purifying agent, both from within and without, therefore, it is good for the skin. This is mainly due to the essential oil, eugenol, as it is a powerful antimicrobial that is widely believed to help with many skin disorders, as well as a linoleic acid which is helpful for clogged pores. The phytochemicals in Tulsi may help to prevent chemical-induced skin, oral, liver and lung cancers. The leaves of Holy Basil are specific for the treatment of fever in Ayurvedic holistic medicine. Both the old texts and modern research back the use of this herbal tincture for suppressing cough and easing congestion by calming and dilating the lungs airways. The oleanolic acid, ursolic acid, and polyphenolic constituents help ward off allergies and infection-induced respiratory inflammation. It also modulates healthy immune response and supports recovery from respiratory illness. It is considered to be an excellent germicide, antibiotic, fungicidal and disinfectant agent which may protect the body from all sorts of bacterial, viral and fungal infections. Non-Alcohol: Holy Basil Leaf, Structured Water, Vegetable Glycerin. Instructions: Use 6-12 drops in mouth, juice or water. May be taken up to 3 times daily. Shake well. Store in a cool dry place. Keep out of reach of children. Contraindications: There are no known side effects or contraindications for Holy Basil at the time of this writing. Not a lot is known of the effects on pregnancy or breastfeeding, so stay on the safe side and avoid its use.